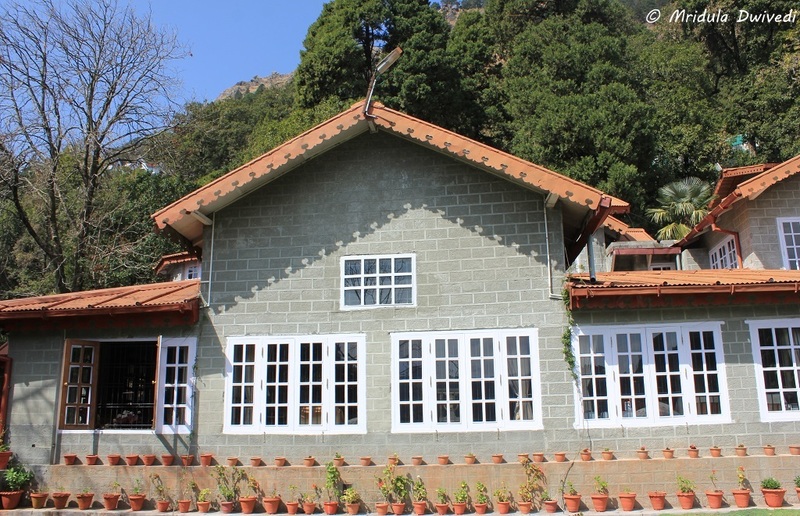 Chhavi and I visited Abbotsford Nainital in March, just before Holi. It is a beautiful cottage built in 1876. It came to the Prasada Family in 1903. The home is full of old family photographs and curios which kept me engrossed. But then I am running ahead of me. Let me start at the beginning. 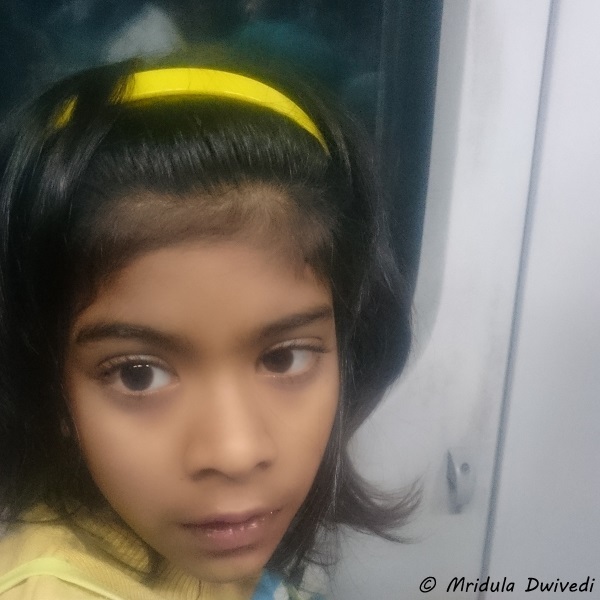 We took the Kathgodam Shatabdi which leaves New Delhi Railway Station at 6.00 am. That means a 4.30 start from home! That left both Chhavi and me cranky. But we tolerated each-other well throughout the train journey. Then we had to take Avomine for our motion sickness and that made us even crankier! The road trip from Kathgodam to Nainital was a breeze. But the kid was getting even more crankier by the minute and I don’t blame her. I was scared she would be too tired to enjoy anything after we reached. But I was wrong. We were staying in the Kings Room which is within the old building. It was a charming room. 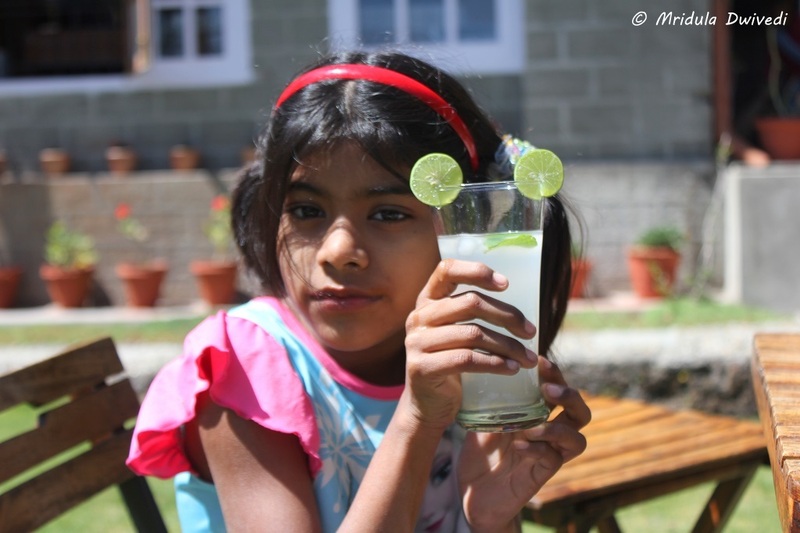 But more than anything Chhavi perked up at the sight of big open lawn where we had our lunch. It is an outdoor Cafe, Chica, which is open to public. Chhavi had a paratha in the car but I was surprised that she ate lunch as well. Then all the tiredness was forgotten! She was her jumping self again! I did not anticipate the weather getting so chilly at the nights at Nainital in March. Our room had a blower which we used all night for the first night. I ended up buying a thick sweater and shoes for Chhavi the next day. They gave us hot water bags to put at out feet inside the quilt at night. Even Chhavi relished it to the core, for me it was sheer bliss! The room had a TV too. Chhavi was happy that she could watch her cartoons! But nobody watched much TV. Our room was huge, it got natural light throughout the day. It was done tastefully. It had an amazing arched roof! With a small and active child I am quite scared that she would break something! 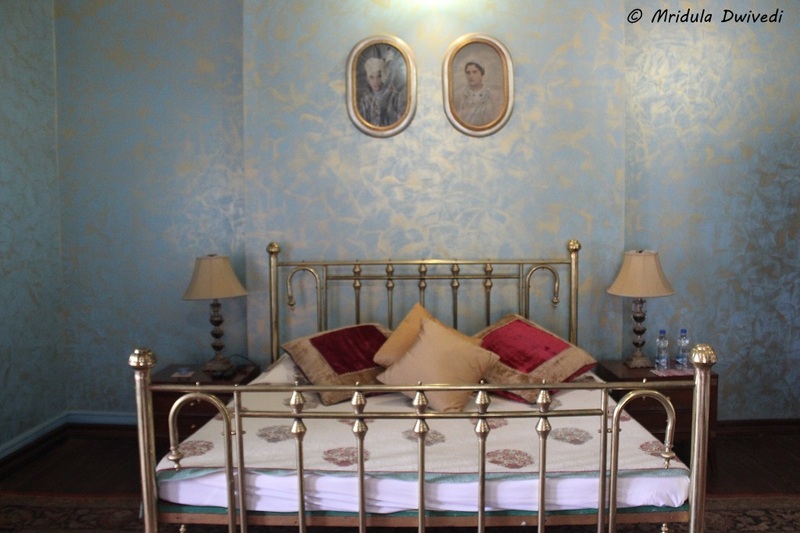 My room had only a few delicate things, like an ashtray, an attar bottle, a candle stand etc. But the main section on the ground floor was full of bric-a-bracs that required care! I have to say Chhavi managed not to break anything once again! The bathroom has a shower, a bucket, Forest Essentials toiletries, hot water, all little things that made us comfortable. 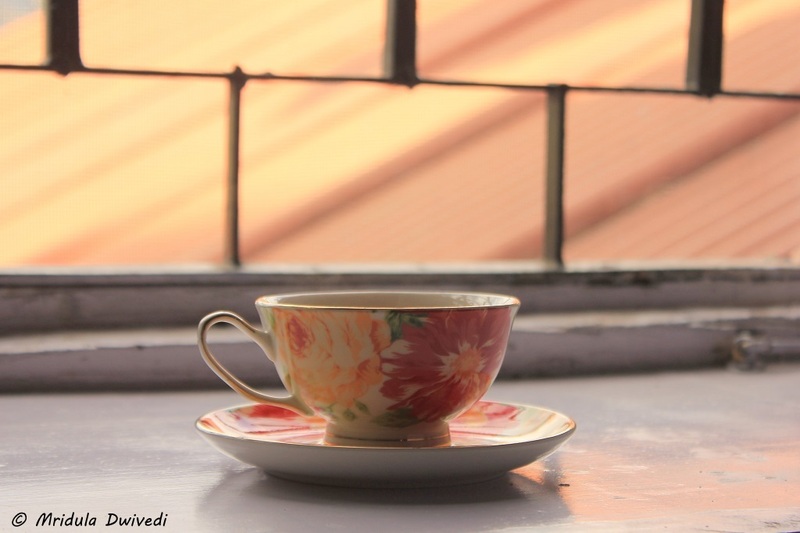 Chai- My All Time Favorite! We took it easy on the first day. It was mainly about food, chai, soups and conversations! Which brings me to the next topic, food! The food at Nainital is homely. And if you travel frequently, that is a blessing. 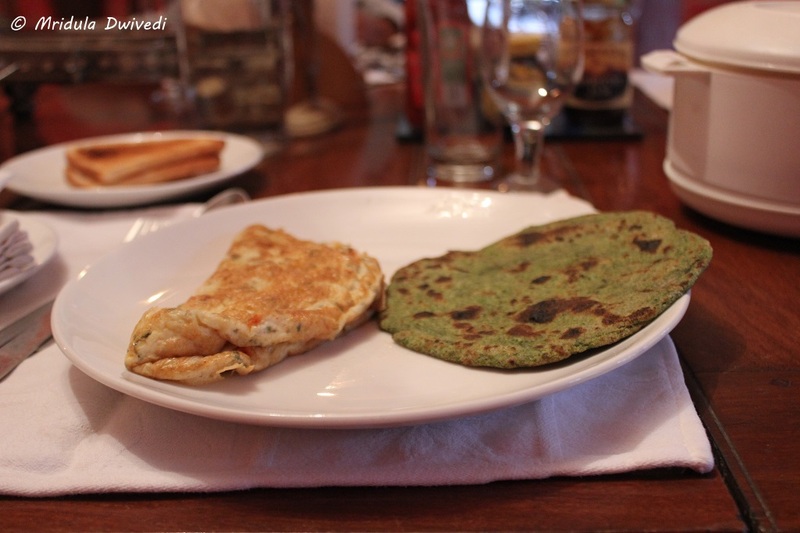 The breakfast had roti, toast, omelette, excellent local jams, butter and tea. I am sure you will get coffee to you want it. The lunch was Indian style with sabzi, daal, roti and chawal with farm fresh salad. One night we had continental food which both Chhavi and I like. The second night was a feast for us. We had a bonfire outdoors, we had wine and we had local food with bhang ki chatni. It was a true feast! Baby with a Baby carrot! There were baby carrots growing in their garden. 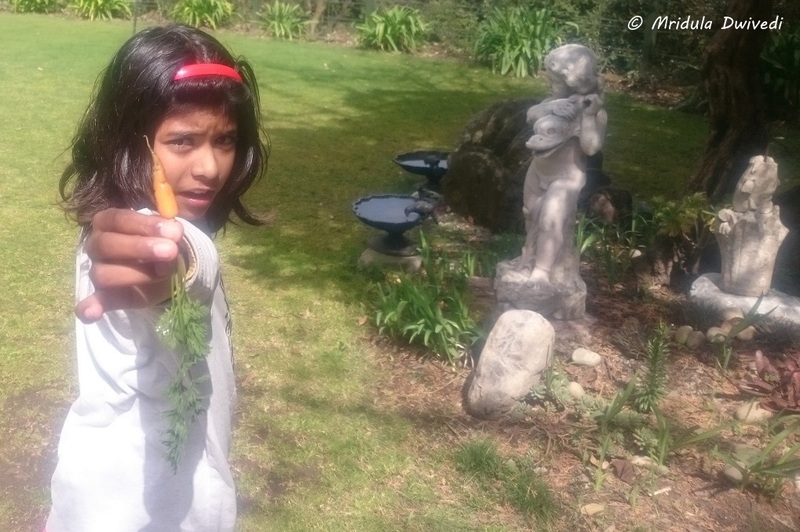 It was a first for Chhavi, to see carrot getting dug out, and then being handed to her to wash and eat! The flowers had just started to bloom. 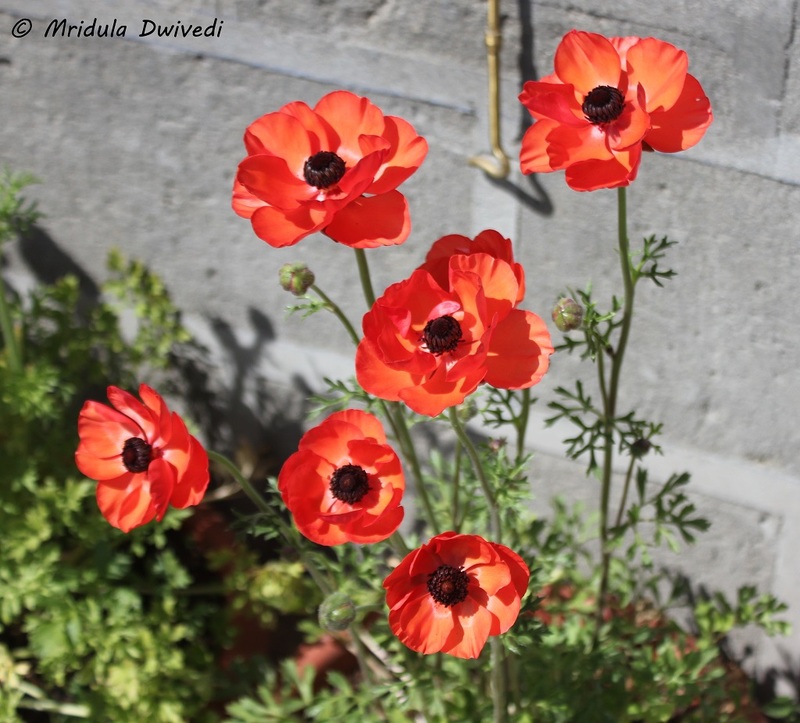 The poppies were such a source of cheer! 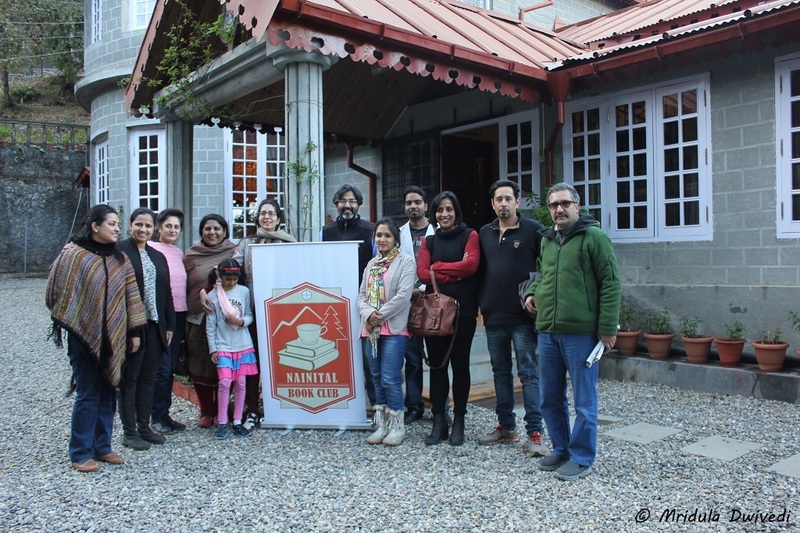 The nainital Book Club with One Temporary Member! 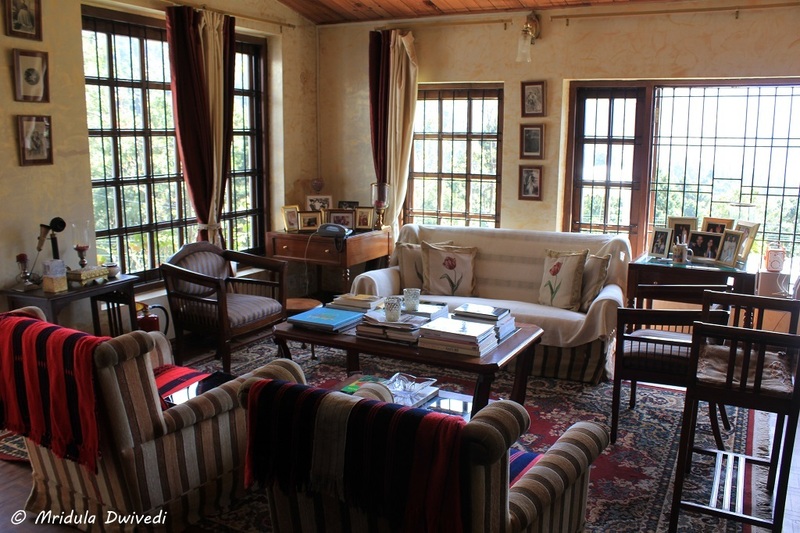 I was lucky that my stay coincided with the inaugural meeting of the Nainital Book Club. The first meeting was held at Abbotsford and the book they discussed was The Immortals of Meluha. I have not read it but I found the discussion quite engrossing. I wish them the very best for their future meetings. We went on a hike, and Chhavi and I ventured into the city too, but that is the topic of a separate post! The Mickey Mouse Ears Made by Chhavi! Traveling with a child gives a different hue to a trip. Children will Abbotsford because they have huge open areas to run around though they have to be careful indoors. An Ideal Place to do Nothing! PS. My stay at Abbotsford was sponsored by them.